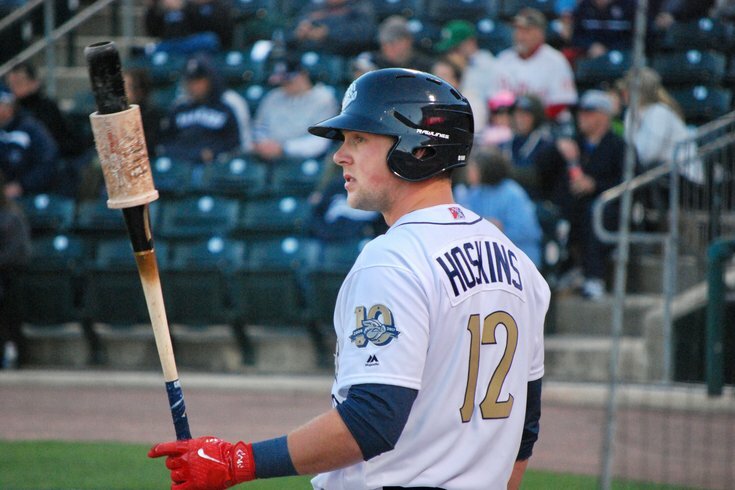 Rhys Hoskins leads the International League in OPS and home runs. He could make his major league debut for the Phillies as soon as tomorrow night ... as a left fielder. And on the third day, Rhys Hoskins was penciled into his regular spot in the middle of Dusty Wathan’s lineup card at Triple-A Lehigh Valley and in his new irregular spot in the field. Hoskins, the best hitter in the Phillies farm system for two years running, was set to start Wednesday night’s game against Alec Asher and the Norfolk Tides in left field. So this is a bad idea, right? Taking a guy with a major league-ready bat but somewhat questionable glove at first base and sticking him out in the outfield? And, quite possibly, sticking him out in left field in a major league game just three days after making his first start out there in a half decade? Because that would appear to be the plan here, calling up Hoskins to make his MLB debut as soon as Thursday night at Citizens Bank Park against the New York Mets. It’s actually quite the opposite. It’s a smart move at this juncture in the Phillies season for several reasons, and mostly because it’s a temporary solution to a problem the front office really doesn’t need to make a final decision on for another six months, at least. Before we count down the reasons it’s smart, we’ll add one caveat: as with the previous front office’s hasty decision to stick Cody Asche out in left field two years ago to make room for top hitting prospect Maikel Franco, the current front office should have had a bit more foresight going into 2017. They knew Hoskins was a talented, close-to-MLB-ready hitter and they knew they still wanted to evaluate Tommy Joseph at the big league level, too. The Phillies could have started this process sooner, even back in spring training. But that’s in the past, and maybe it’s just as well that the Rhys Hoskins Outfield Experiment is being carefully fit into a few weeks toward the tail end of a lost season, and not over a larger chunk of games. Hoskins, 24, is in his third full minor league season since being selected with the Phillies fifth-round pick in 2014. He has passed each of those three seasons with flying colors: a .913 OPS with 17 home runs and 36 doubles in 135 games between Class A Clearwater and Low-A Lakewood in 2015, a .943 OPS with 38 home runs and 26 doubles in 135 games at Double-A in ’16, and a .954 OPS with 28 home runs and 23 doubles in 114 games at Triple-A this year entering Wednesday night. Hoskins’ OPS ranks first in the International League and second among all Triple-A players who have played in at least 100 games. His .383 OBP also ranks first in the International League (and fourth among all Triple-A players). Hoskins’ 28 home runs also leads the International League (more than former MLB slugger Pedro Alvarez) and ranks third among all Triple-A players. It's not just the cumulative numbers that are impressive, but also the way Hoskins has accumulated those numbers. He’s been more disciplined as a hitter in 2017. Entering Wednesday, Hoskins had 50 fewer strikeouts than a year ago (in 21 fewer games, to be fair) and he is just seven walks away from tying last year’s total. Hoskins' strikeout rate (21.2 percent last year, 16 percent this year) has dropped, while his walk rate (12 percent last year, 13.6 percent this year) has increased. You probably knew all of that, right? Folks have been clamoring for Hoskins’ big league promotion before he was selected to play in last month’s MLB Futures All-Star Game and in the Triple-A All-Star Game. But why the heck left field? Seventeen years ago, the Phillies had a right-handed hitting power prospect ready for a major league audition but with no obvious place to play. After hitting 29 home runs and sporting a 1.028 OPS in 127 games between Double-A and Triple-A a year earlier, former No.1 overall pick Pat Burrell was off to a productive start at Scranton/Wilkes-Barre in the spring of 2000 … but Burrell, a former collegiate third baseman had transitioned to left field in the minor leagues and the Phillies had three outfielders. Former two-time All-Star Ron Gant, acquired in a trade before the ’99 season, was in the midst of a 20-homer season in 2000. Doug Glanville was coming off a .325/.376/.457 season in ’99. which is impressive in retrospect until you look at the slash line in the previous season from the guy playing to his left, Bobby Abreu: .335/.446/.549. And so, on May 24, 2000, Pat Burrell made his major league debut at Enron Field in Houston hitting fifth in the Phillies lineup, between Mike Lieberthal and Kevin Jordan, and playing first base. Now, Burrell had played first base at Triple-A, but he’d also made 75 percent of his starts as the Red Barons regular left fielder. Still, the Phils found a place for him to play: first base was regularly manned by the mostly forgettable Rico Brogna-Travis Lee combo in 2000. Burrell made each of his first 58 major league starts at first base, nearly more appearances at this position than in three years in the minor leagues (65 starts at first base) combined. But it also proved to be nothing more than a temporary solution to the front office’s desire to see Burrell in the big leagues and no permanent place to play him in the field: within a three-day span in July, the Phillies traded away Ron Gant (for Kent Bottenfield) and traded for Travis Lee (in that forgettable Curt Schilling trade) and, after Lee initially made nine starts in left field following the trade, he and Burrell flipped spots and the rest was history (a history that included Burrell riding in the front of a parade with a dog named Elvis). But, again, why left field??!? Just two weeks ago there was a somewhat popular news item as the Phils neared the trade deadline: what if they were unable to trade Howie Kendrick and were stuck with trying to play four players (Kendrick, Aaron Altherr, Odubel Herrera, and Nick Williams) in three spots? Here’s the thing about those problems: they generally work themselves out (mostly because injuries happen on the regular). And wouldn’t you know it, here we are less than two weeks later and Kendrick has been traded and Altherr is back on the disabled list again with a troubling hamstring injury. And so the Phillies have a vacancy in a corner outfield spot for a young player they’d like to evaluate (more so in the batter’s box than what he can or can’t do in left field). Unless Hoskins absolutely embarrasses himself out there (this doesn’t seem likely, he is a 24-year-old professional athlete) there is nothing at all wrong with trying him at the position with 50-some games remaining on the Phillies 2017 schedule. The Phillies won World Series with Pat Burrell and Greg Luzinski playing left field and went to two World Series with Pete Incaviglia and Raul Ibanez playing out there regularly. And even current broadcaster and former beloved Phillies first baseman John Kruk regularly played in the outfield in his 20s. So Hoskins will be fine. But why not first base? Because it would be foolish to just bench Tommy Joseph, a former top hitting prospect in his own right who survived countless injuries, who is only 610 days older than Hoskins, who has five years remaining of club control, and who has handled himself adequately since taking over regular first base duties after working a timeshare with Ryan Howard last season. In his last 162 games, dating back to last year, Joseph is slashing .250/.314/.446 with 24 home runs and 30 doubles. Middle of the road-type numbers for a big league first baseman? Yeah. But you probably would have had a similar, not-impressed reaction to Altherr’s career slash line in parts of three MLB seasons/393 plate appearances entering this season – .212/.311/.365 – and you probably also would have scoffed at Cesar Hernandez’s production before the 2016 season (.664 OPS in his first 227 MLB games) and, well, we all now know how that would have worked out. Demoting or benching Joseph makes little sense. Keeping him in the lineup so he can continue to develop (and, if you’re Matt Klentak, hopefully fatten his stats in the next seven weeks leading into the offseason) puts you in a better place to make a more productive decision this winter for the long run. And when/if Altherr returns from the DL before September, then you'll figure out what to do then, but, as we explained with the outfield conundrum two weeks ago, these things tend to work themselves out. Playing Hoskins in the big leagues, period, is probably long overdue. Playing him in left field is a suitable short-term solution in 2017.